Laser printers work by using a laser beam to transfer an image to an electrically charged, photo-sensitive drum. The charge on the drum attracts toner ink, which is transferred to the paper. 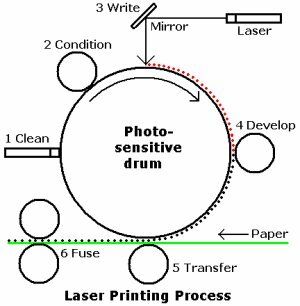 The primary steps in the laser printing process are listed below. 1. Clean. Any residual toner is cleaned from the drum. 2. Condition. A high electrostatic charge is placed on the surface of the drum. 3. Write. The laser is aimed at a rotating mirror which directs it to the drum. Under program control the beam is used to discharge areas on the surface of the Photosensitive drum corresponding to the light areas of the image. 4. Develop. Toner, very fine particles of plastic and carbon, are attracted to the charged areas of the drum. The higher the charge remaining on a particular area, the more toner that is attracted to that area on the surface of the drum. 5. Transfer. A strong electrical charge is placed on the paper, causing the toner to transfer from the surface of the drum to the surface of the paper. 6. Fuse. Heat is used to fix the toner to the paper. Laser printers, with resolutions up to 2400 dpi (dots per inch), can produce higher quality prints than ink-jet printers. Some laser printers contain four toner cartridges with four different colors, allowing them to print high quality color images. Laser printers can also print at much higher speeds than ink-jet printers. The cost per print is also lower for a laser printer than it is for an ink-jet printer. The disadvantage of laser printers is that they can't print on heat sensitive media like transparencies. Because laser printers print at higher speeds, if you try to print on very cheap paper that has a high moisure content, you will experience frequent paper jams. Producing crisp, clean copies with a laser printer requires the drum to be undamaged and the drum cleaning mechanism to be working properly. Most laser printes do not stop when toner gets low. They continue printing fadded copies until someone takes the time to refil or replace the toner cartridge. Another disadvantage of laser printers is that keeping the fuser element hot while the printer is idle consumes significant power. • What is USB OTG? • Why Does My Hard Drive Show Less Space Than the Specification?